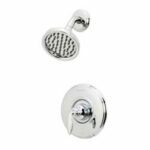 Expert advice on how showers, including shower types and styles, with information on shower parts and a helpful shower plumbing diagrams. 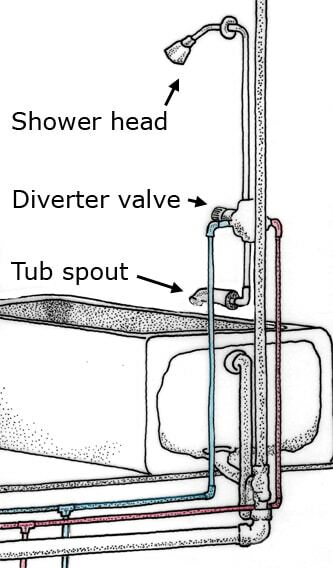 The diverter valve in a bathtub switches the flow of water from the spout to the shower head. This European bathtub didn’t have a shower, so the valve and a new pipe to a shower head are being added. Showers are fundamentally a very simple appliance designed to contain water and a person or two and to drain spent water into the sewer system. Of course, from those basics, a world of possibilities has been developed. Showers are made in many different types, sizes, shapes, colors, and configurations. Showers may be built-in or prefabricated. 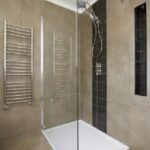 Built-in showers are essentially small rooms with walls of tile, stone, or some other waterproof material and a glass door that slides or swings open. The floor may be a one-piece unit made of plastic or some type of solid-surfacing material; commonly, the floor is tile with a pan that’s flashed and hot-mopped using methods similar to those used on a flat roof. 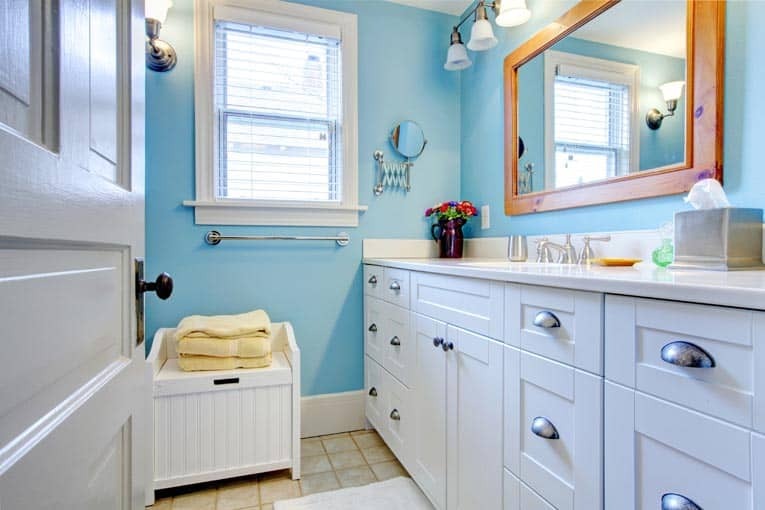 Prefabricated showers are made from fiberglass-reinforced acrylic or fiberglass and come in a wide range of colors and styles. Some are made as single, one-piece units that are installed during construction; others as modular units consisting of a base and three walls. Showers may be installed in one of three ways: as a single unit, as a modular set, or as a custom built-in. A shower drain is made of several parts. Beneath the removable strainer cover in the shower floor, the drain leads to an under-floor trap that connects to a drain line and the waste/vent stack. 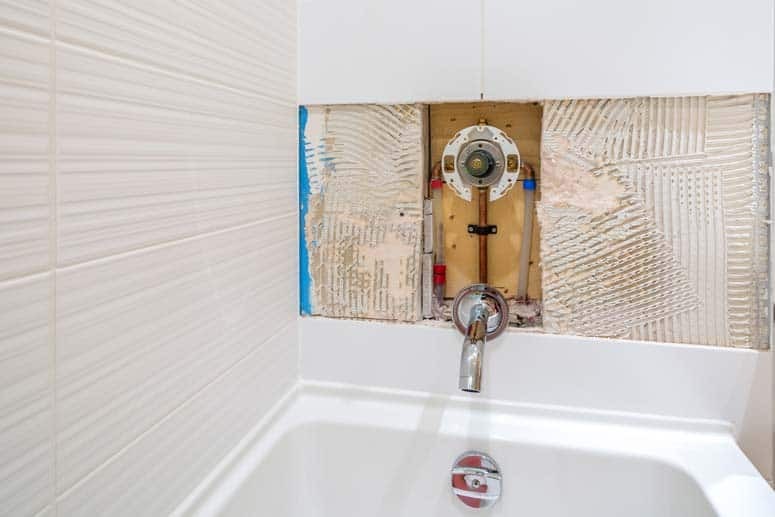 It’s critical that the shower pan at the base not leak over time, as this will rot the floor, so some type of waterproofing system is employed during construction. Though grout can be repaired and joints can be recaulked, if the shower pan is leaking, you’ll need to have it repaired by a tile installer or roofing contractor. Contact your homeowner’s insurance company to find out if repairing the damage is covered. 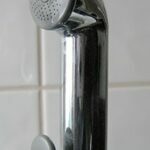 A diverter valve directs the water either to the shower head or to the tub spout. The water supply for a shower arrives via two pipes: hot and cold. In construction that is less than 30 years old, these pipes are usually copper. The pipes connect to a shower valve that controls the temperature and flow of water to the shower head. In a setup where the bathtub and shower are combined, this valve is called a “diverter valve.” A diverter valve may also switch the flow of water from the tub spout to the shower head (on some bathtubs, there is a lever on the tub spout that switches the flow). Today’s shower valves typically have some type of temperature limiting device to prevent scalding and/or major swings in water temperature. For more about this, see Thermostatic Shower Valve Buying Guide.